I’ve seen firsthand the tactics of these killers. ~ George W. Bush (1946-07-06 age:71), bragging about his combat experience in Iraq. Perhaps he counts wrestling with a plastic turkey. 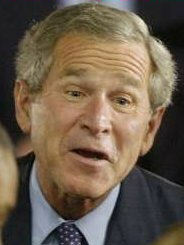 ~ George W. Bush (1946-07-06 age:71), reported by Dean Tran, seen on CNN (Cable News Network) just prior to the invasion. Somebody remind George Walter Mitty George W. Bush the USA has more weapons than all the rest of the world put together and that his daddy soundly defeated Iraq in Gulf War I and UN (United Nations) inspectors then destroyed 95% of its remaining weapons. Before Gulf War II, Iraq ranked #35 not #1 as a military power. America spent 283 times as much each year on the military as Iraq did prior to the Iraq war.